What should I do with my Section Creation Link? After you upload your Common Cartridge to your LMS: either Blackboard, D2L or Moodle (not in Canvas- see last paragraph for more information), you will see that the first link in your 'Knewton Coursework' content is named the same title as your course. This is your Section Creation or Initialization Link. When you click this link, it will automatically create a section within your alta course that is linked to your LMS course. Once you've finished creating your sections, you can either delete or hide this link so that your students do not click on it (this will result in an error). 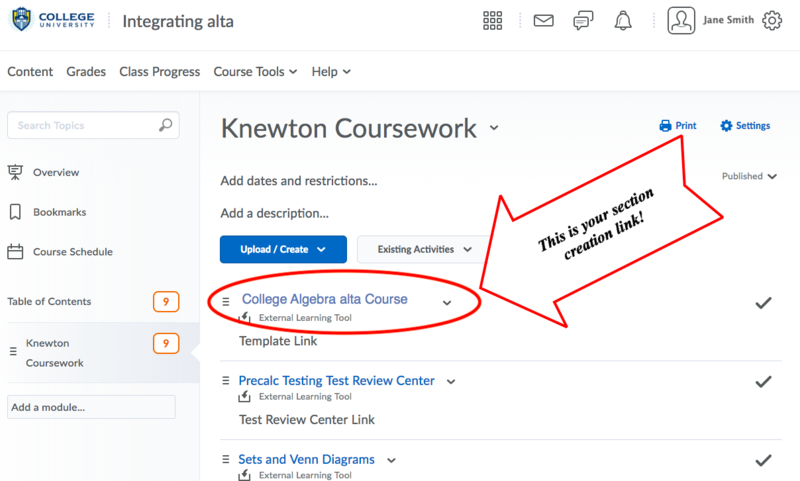 After you upload your Common Cartridge, you will see that the first link in your 'Knewton Coursework' content is named 'Link this Section to Knewton alta'. This is your Section Creation or Initialization Link. When you click this link, it will automatically create a section within your alta course that is linked to your Canvas course. To see the step by step instructions for how to hide links in Canvas, follow this link to check out our 'Adding Knewton Assignments Instructor Guide'.